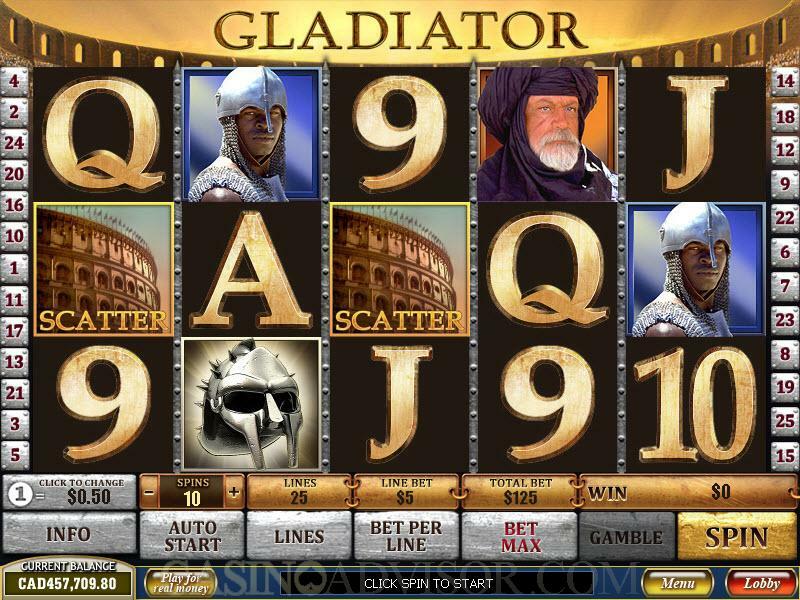 Most online casino software companies are licensing their uniquely themed slot games, and Playtech has also followed suit with the game Gladiator. This game is part of the new range of slot games that the company has recently launched, and features five reels and 25 individual pay-lines. The high number of possible paylines means that with a higher bet, players will have a higher chance of winning the big prizes associated with this game. The popularity of the gladiator was greatly increased after the release of the movie, and Playtech is looking to capture a large audience with this game. As a result, they have taken great care to design this game and have included some amazing graphics and animation. A stunning soundtrack that runs throughout the game suitably accompanies the visuals of the game to make it an incredibly thrilling experience. All of the symbols and characters in the game are taken from the movie Gladiators, and they are very lifelike, providing the player with entertainment for hours together. 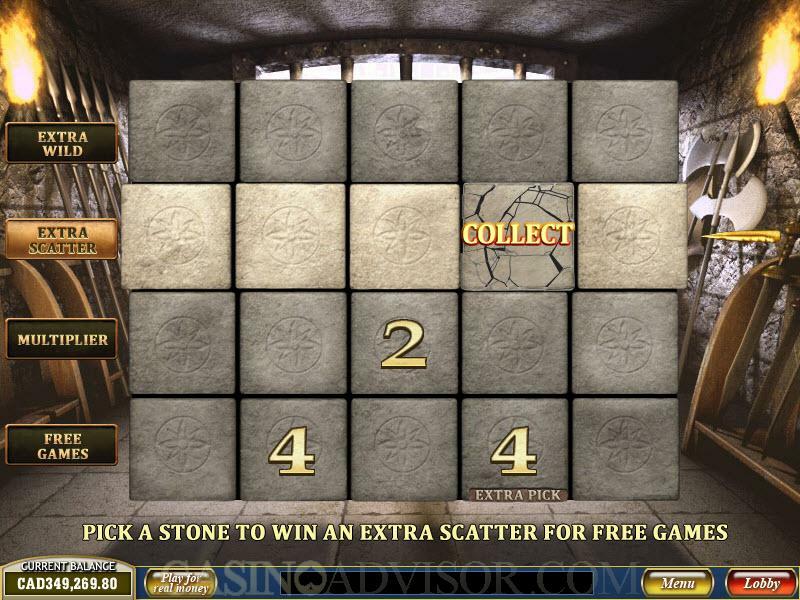 With a wild symbol, scatter symbol, two bonus games as well as a gamble option, this game is packed with features. 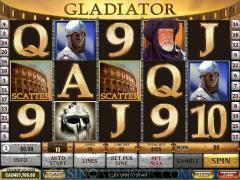 Gladiator is offered to players in a number of online casinos. These casinos are all powered by the new generation Playtech software, which makes them very reliable. For players who are not yet ready to make an actual wager, they can choose to play the free version which is available at most casinos. However, this free version does not entitle the player to any of the prize money associated with the game. Real money players have the option of wagering anywhere between one and five coins per activated pay-line. The coin sizes vary from $0.01 and $5, which allow the players a lot of freedom in terms of betting options. With a minimum bet of one coin on one pay-line, and a maximum of 250 coins per spin, this game can be very rewarding with regards to the amount wagered. The game also has an autoplay feature which can be put into motion at any time. Using this option, the player can set the number of spins and the amount to be wagered as well as the number of activated paylines. The computer then takes over and plays the game without any assistance from the player. The regular symbols in this game are the General Maximus, Senator Gracchus, Emperor Marcus Aurelius, Lucilla, Ace, King, Queen, Jack, Ten and Nine. These symbols appear most often on the reels and all of them have a payout associated with them if they appear three or more times. The wild symbol in this game is the Gladiator Helmet which can only appear on the reels #2, #3 and #4. The Gladiator Helmet can substitute for all other symbols to complete a winning combination. There is no regular win associated with this symbol, but when it appears simultaneously on the three reels, then it initiates the Gladiator Bonus Round. In this round, the player sees a window on the centre of the screen. This window has 9 masks which represent 10x, 5x and 2x the total bet. The player wins an amount which is equivalent to the total value of all the nine masks. The scatter symbol is the Coliseum symbol which can appear scattered anywhere on the reels. When there are two or more scatter symbols on the reels, the player is paid an amount which ranges from 2x to 100x the triggering line bet. When there are three or more scatter symbols, the Coliseum bonus round is activated. 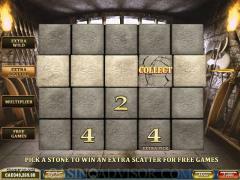 In the Coliseum Bonus Round, the player is shown an array of stones that are arranged in a 4x5 matrix. He/she must select one stone from each row. The first row represents the number of free spins, the second row represents the multiplier, the third has the extra scatter symbol that can be used in the free spins and the fourth row have an extra wild symbol for the free spins. In addition to these features, the player can also choose the gamble option which is available whenever a winning combination is completed. The player has a chance to double or quadruple the winnings depending on his/her choice of the right color and right symbol respectively. Interested in reading more detailed information about Gladiator? If so Click Here for more details.